Manna classes itself as casual, but dishes up anything but. Omnivores and vegetarians alike will find something on the restaurant’s lavish menu, and can expect a top notch meal without the pretentiousness of your typical fine dining fayre. Whether you’re feeling adventurous or you like old classics, Manna has something for everyone. Oh, and the staff are lovely. 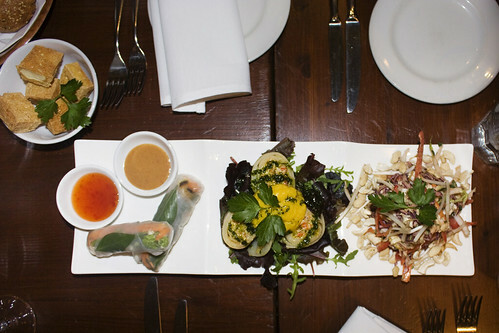 Crispy marinated tofu (top right) and Manna mezze platter, including, from left to right: spring rolls, smoky tofu & potato roulade, and living pad thai. For starters we ordered the Manna Mezze platter, which offered a choice of 3 appetisers on one plate. The Living Pad Thai was one of my favourites, and not just because it was everyone else’s least favourite (hence I pretty much got to eat it all). 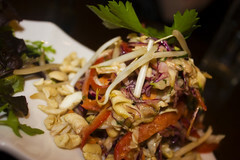 It’s a tangy raw salad with mild chili undertone with a great balance of flavours. I’d order it again. raw carrots, courgettes, red cabbage, chinese leaves, mung bean sprouts, basil, mint and cashews in a white almond chilli sauce. A good complement to the pad thai, the similar ingredients are well suited to these Vietnamese style spring rolls. Plus I got all the sweet chili sauce all to myself. Bring it on! rice paper wrap, julienned carrots, red pepper, mange tout, shitake mushrooms, chinese leaves, thai basil & mint with a peanut sesame dip & chilli sauce. I think it’s safe to say the smoky tofu & potato roulade was everyone’s favourite. Smooth, smoky, and delicious, if you’ve got to chose only one starter then this should be it. a light potato roll with an oyster mushroom & herbed tofu filling. “It smells like deep fry!” was one friend’s comment as soon as the crispy tofu hit the table. Naturally that’s probably in the top 5 of her compliment repetoire, so I’m pretty sure it was a hit. I tried a small piece and what can I say? You can’t knock the effects of hot oil. 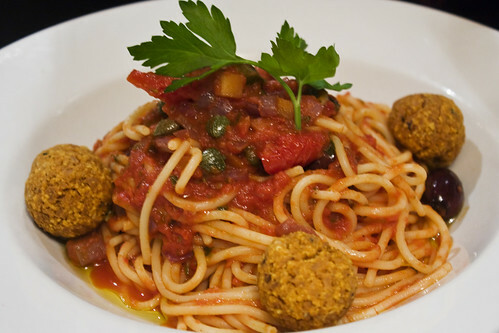 Two friends ordered the Organic Spaghetti & Meatfree Balls, a dish which Manna’s evidently fairly well known for in the veg community. I stole a taste of the sauce when no one was looking (okay she was looking, but I think she was finished) and it was pretty tasty. No complaints from their end, anyway! A plate of the organic pasta of the day also landed on our table, and as it was next to me the sampling was less tricky. When I go out to eat, I generally avoid pasta dishes as I want to order something that wouldn’t be so easy to make at home. That doesn’t mean I don’t drool over them because, let’s face it, pasta is pretty much one of the most gnarly (goal of the night: use gnarly more often) things ever, and the pesto sauce here was pretty damned good. 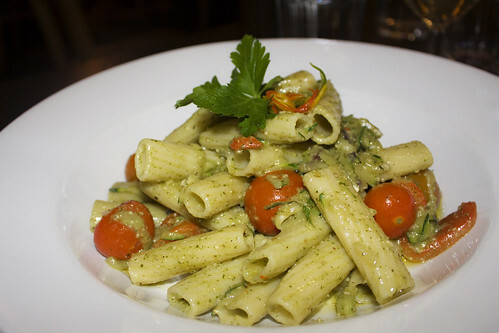 green bean, cherry tomato, courgette tortiglioni with a basil & cashew pesto. And my main, the chef’s special, which just happened to tickle my fancy (I’d just picked up a load of goodies from the Taqueria, so Latin American food was on the brain). The avocado was a bit less than ripe, but it’s also ridiculously hard to find a good one in this country. Otherwise the dish was delicious, and the black bean and mango salsa was perfect. I’m also always happy when I eat out and the rice I’m served is minimal (far too often restaurants go the cheap route and serve more rice than anything, presumably as a filler). The chimichanga filling was thick and smooth, a creamy smokey portion of vegetables and tofu that would fill anyone’s belly substantially. If you like Latin food but no spice, this is perfect. 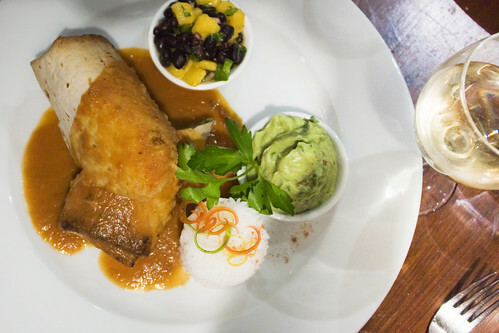 pea potato smokey bean curd chimichanga with lime basmati rice, red pepper chipotle sauce, mango black bean salsa, and guacamole. 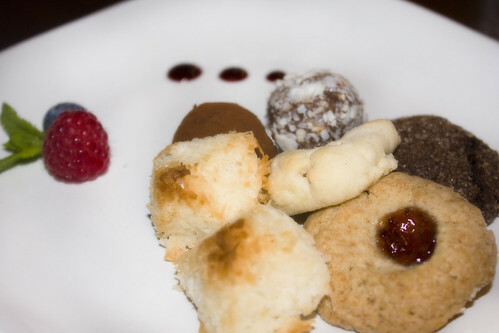 Clearly we went all out with the puddings, and the petit fours were a “trweat,” a complimentary extra from following Manna on Twitter. 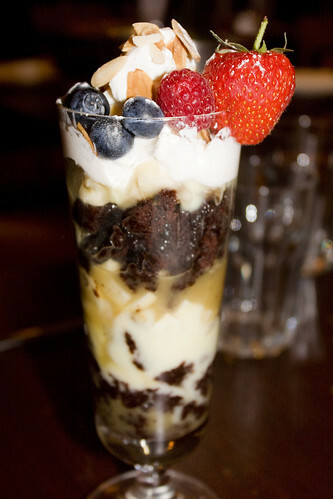 The banofee trifle and the chocolate mousse were the winners of the day in my opinion, so when you’re next there and staring that desert menu down, here’s a tip: just go ahead and order them both. 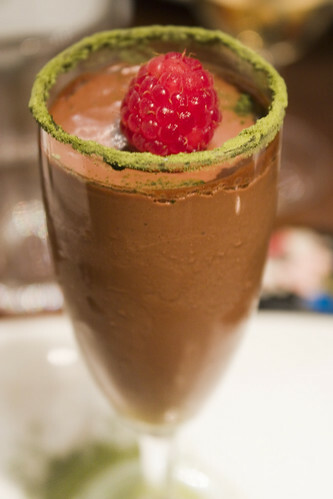 The mousse is the best I’ve had; vegan chocolate mousse is both easy to make and make taste good, but this was simply divine. And the trifle, it was massive, and amazing, and gone before I could reach my spoon back into my friend’s quickly empty dish. The other puddings were good as well (though I wasn’t expecting biscuits when the petit fours were announced). So sweetly, the kitchen added a happy birthday message to the plate of my friend’s crumble, a really nice touch. 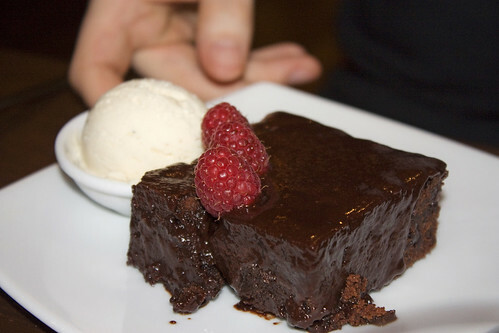 One thing I do wish, however, is that vegan restaurants would consider something more than Swedish Glace for ice cream. I know the commercial options are limited, but there must be an ice cream shop or gelateria out there who’d be up for the job? Manna is a lovely restaurant in a choice location, complete with good food and more than amiable staff (something with which more British establishments could do). It’s not cheap, but then again I don’t think food should be. 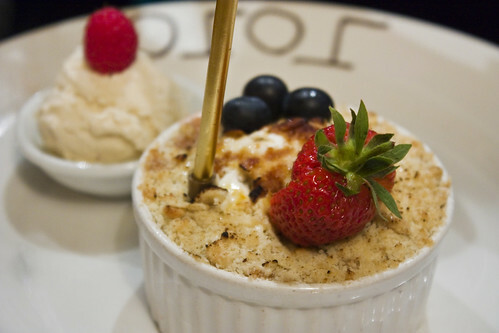 I’m of the opinion that a meal out should be a treat, and that’s precisely what you’ll get when (not if) you visit Manna. We’ll definitely be returning.